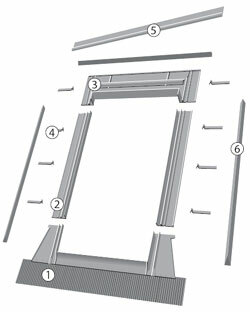 These special flashings are intended for side hung escape windows. There are four variants of flashings for side hung windows: ESW, EZW, EHW or ELW. Side hung escape windows can be combined horizontally, they can also be combined with centre pivot FT windows, with top hung windows FP or FK, to an installation depth of N, matching windows of the same height. The flashing consists of four basic elements. The lower part of the flashing has a plastic mass attached underneath that allows it to be stuck to the roofing material, to provide a tight fit. EZW and EHW versions of the flashing are ended with an elastic apron. Flashings are also fitted with a weep flap in order to channel condensation away from the initial sheeting out of the window and insulating side sponge seals providing protection against wind blown dust, leaves and snow.